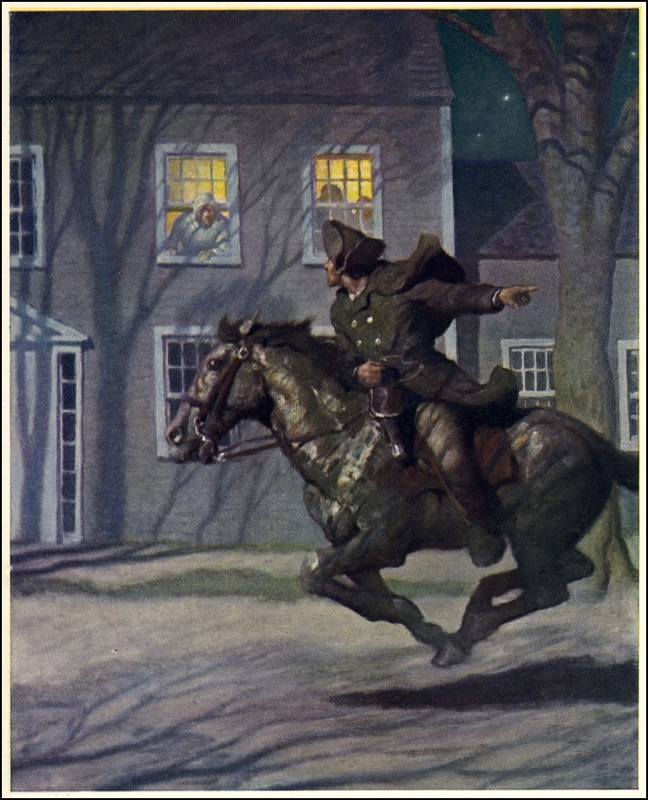 Most depictions of the more famous Midnight Ride on April 19 (whether it be in books, movies, even art) portray the colonists as shocked, surprised, astonished. “The British are coming? Really? …Where did I leave my flintlock?” This irks me. Fact is, the Massachusetts Provincial Congress had been preparing for the inevitable day in an organized fashion for months. The companies of militia and minutemen in each town had been drilling and training since the fall of 1774. The Massachusetts Committee of Safety had taken steps to organize them into an army and had massed supplies in Concord and other places to outfit that army. That the British would strike at Concord to take those supplies was no stunner. The only question was when. To Gage’s credit, he acted quickly. The very next day, he implemented his plan to send an expeditionary force to Concord. The elite companies from several infantry regiments, the crack troops, namely the light infantry and grenadier companies, were relieved from all duties under the guise of an assignment for drill in “new evolutions.” Gage coordinated with the British Navy presence in Boston harbor (which was significant) to have long boats moved to the shore of Boston Common. He intended to transport roughly 800 soldiers from Boston Common across the Charles River, to the marshy shores of Cambridge. Thence they would march for Concord. The Sons of Liberty in Boston took careful notice of all this activity. They were aware that the elite companies had been relieved of their regular duties. They saw the long boats moved. They knew the expedition to Concord was at hand. Massachusetts Provincial Congress, the extra-legal legislature established in defiance of the King in September 1774, had been meeting mostly in Concord. Its two most important leaders, John Hancock and Sam Adams, had left Boston, fearing the likelihood of their arrest, and taken up residence in the house of Reverend Jonas Clarke in Lexington. Paul Revere, as the most dependable and respected courier among the Sons of Liberty, had made many rides from Boston to Lexington and back, bringing dispatches from Dr. Joseph Warren (the only key leader of the Sons of Liberty who chose to remain in Boston) to Hancock and Adams. A busy man, he brought correspondence to many other places in New England, helping to keep the various Committees of Correspondence informed. On Sunday, April 16, 1775, even though it was the Sabbath, Revere made the ride from Boston to Lexington to inform Hancock and Adams of the British preparations in Boston. This ride was not made at midnight. He did not holler about British or Regulars or pound on doors. In all likelihood, few people noticed him pass. It was not a dramatic ride. But the importance of it cannot be overstated. Once word reached Hancock and Adams in Lexington that the British were clearly about to move, everything changed. Orders were issued to remove all military supplies from Concord. For the next three days, provincials would work feverishly to move cannons, gunpowder, tents, tools, muskets, musket balls, cartridge paper, rations and all manner of things that an army required from Concord. These implements of war were hidden in woods, sometimes buried underground, distributed to towns far and wide. I grew up in Acton, Massachusetts, bordering on Concord. Colonial records indicate that two cannons were sent to Acton to be hidden. According to legend, they were buried on the farm of Captain Joseph Robbins who commanded the Acton militia company. Robbins’s house is long gone, now marked by an inscribed boulder. The land behind the site of his house is now a soccer field. As a kid, I longed to venture onto that soccer field at night with a shovel. I was convinced, absolutely sure I would somehow find a forgotten cannon still buried there…Never did try it, though. Long and short of it, by April 19 virtually all of the military supplies in Concord had been hidden away. The Midnight Ride was indeed important, as Paul Revere…and many other alarms riders…awakened the provincial countryside to the fact that the precise moment was at hand. But the key warning had already been delivered. Because of Revere’s ride on April 16, the British expedition had, before it even left Boston, already failed. This entry was posted on Thursday, April 12th, 2012 at 4:45 pm	and tagged with Acton Massachusetts, American History, American Revolution, Boston Massachusetts, Concord Massachusetts, History, John Hancock, Paul Revere, Paul Revere's Ride, Samuel Adams, Thomas Gage and posted in American Revolution. You can follow any responses to this entry through the RSS 2.0 feed.